This speaks to my heart – what a furry, soft, cute, pastels and egg hunts and farms and grandparents kind of topic.. my mother had bunnies galore on our little farm. When I was in kindergarten, our class would walk over to our front yard, the kids would sit in a circle and my mom would let oodles of bunnies go, hopping to happy squealing children. How does this springtime topic make you feel, what items in your shop relate to this theme – and when is the last time you’ve petted a soft and cuddly baby animal? We’d love to see your accompanying items and hear your stories. I love your story Opal! I bet those school children will remember that “bunny encounter” forever! These are a couple of kitschy chicks that my daughter and I found at an antique shop. We love their sticker eyes and yellow feather details. 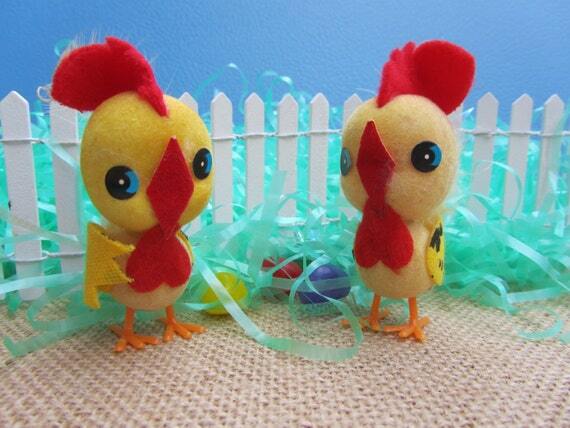 Your Easter chick decorations are so cute Willow Valley Vintage! I love this!! Thank you Opal for organizing! I thought I would share my shops whimsical wine cork Easter bunny ornaments too! Spring time always reminds me of my grandma. Each Easter she would lend me one of her old Sunday hats and we would have brunch in our sunny spring dresses and Easter egg hunts down at the farm! Lots of smiles and laughter come to mind as the birdies are out chirping and the tulips come into bloom. Spring is my favorite time of year! Bring on the bunnies, ducklings, little lambs and especially, the Easter chicks!! Their serious expressions make me think they have a lot on their little chicken minds! When my kids were small, we had a chick that peeped when you held it. Fun for the kids, not so fun on a 13 hour car ride home from Grandma’s house when you can hear the tiny chick — but you cannot find anywhere! ( And we pulled over several times to look!) PEEP, PEEP, PEEP all the way home!! I love the little spring lambs, but I really want to see them grow up and become sheep that eventually will supply us with beautiful yarn (I’m a knitter). These two sheep that simply stole my heart by just standing there and looking at me live in the English countryside in the beautiful Cotswolds where I think they have a good life. Wouldn’t this be a lovely spring greeting? When we had little nieces and nephews we would hold a huge Easter egg hunt out at the farm and hide dozens of plastic eggs. All the siblings would come with their kids and we’d meet at church then afterwards our house and kids would hunt and the entire family would enjoy Easter Ham for lunch. Here is one of the Easter baskets for sale in our shop. My wife embroidered the chicks for the liner. Remember watching the Easter specials on TV and dying eggs for the Easter Bunny as kids? Well that is one of my favorite memories of child hood especially since Easter was a holiday from school I especially remember the Easter Peep sugar overload with my brothers! Here is one pink adorable bunny for your Easter decor! I love the pastels and the new going to church clothes for Easter Sunday. I love the sweets and bake some petit fours and small cakes for brunch. But mostly, with everyone all cleaned up (and they clean up nicely) and dressed up, we make quite the picture of spring in Illinois. Of course, that only last long enough to take some pictures as the kids run to find hidden eggs and the adults take off ties and kick off shoes! I was blessed to grow up on a farm in Iowa with a very crafty and fun loving Mom and Dad! We usually dyed our Easter eggs Saturday night watching and dancing to Lawrence Welk. Then Mom would wind our straight hair onto bristly curlers and we tried to sleep with constant pricking giving us headaches all night! We’d jump up at the crack of dawn to eat breakfast, then we searched for our Easter baskets filled with jelly beans, chocolate bunnies and special surprises. We’d get a jump rope or book or toy we wanted. The little craft/chef/tool aprons I sell were my Mom’s inspiration and they would make a great Easter gift for the littles in your life! I thought I would share this cute candy container from my shop It is made of paper mache, I remember getting candy filled containers as a child for Easter. This would be great to fill with treats! I am sharing this Divided Dish. In my work I use Divided Dishes to Help people feed themselves whether weak, shaky or blind. When I saw this pottery divided dish for Easter I had to buy it to share it with Etsy Shoppers. It’s great for a child’s room, for a child to eat with it, for a Easter serving tray or Easter Display. Spring brings a sense of renewal, a fresh new start, hope, a beginning…memories of wonderful and quality time shared with family. As I start a new chapter in my life and commit full time to my Etsy shop, my hope is for a renewed beginning – a connection to the past and a bridge to the future. Happy Easter and Welcome Spring with this cute little chick in an egg plush beany toy and matching Easter tote with colorful eggs and chicks! A great gift for kids that is sugar free! Spring is my favourite time of year. From cold and grey, suddenly there is sunshine, flowers, and many baby animals. Although rabbits can be pesky if you are a gardener, they look so cute they are easy to forgive. This sweet little rabbit will leave your flowerbeds alone, as he will be safely attached to your bag. Love your entries, stories and wonderful items! As someone who loves to decorate for the Easter Holiday, I love bunnies and Easter eggs and all that goes with it. I made this wreath, created the bunny also – then almost decided to keep it.